1. With the grayscale printing technology, the T32 digital textile printing machine is able to print out the exquisite image with high precision and bright color. 2. It can print on various textile materials and finished clothes in different width. 3. The printing format is 30×50cm. This product can be selected for printing on the XXL type large and small sized clothes. 4. 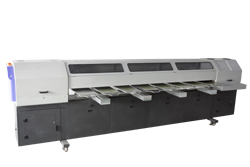 This digital textile printing machine adopts the automatic maintenance system for efficient ink degassing and moisturizing the printing head with ink. 5. It runs with 8 alternating workstations, supporting the online upload and synchronous printing with upload. Rip software Photoprint 10.5, etc.